ECU is one of the world's best young universities (Times Higher Education Top 150 Young University Rankings 2018) and is ranked the top public university in Australia for undergraduate teaching quality (QILT 2019). Studying at ECU's Melbourne and Sydney places you in the largest, and fastest growing, cities in Australia. Our Central Business District sites are located in office buildings in the heart of town, and near public transport. You can expect the same support systems we have on our Perth campuses, embedded into a city location. For example, teaching, examinations, academic support, library support, career support, study spaces and enrolment support are all onsite. Our library services are digital, with librarian support onsite. Almost all textbooks are available electronically. And specialist student services, such as fees and enrolment support, are connected to our students - whether they are on or off campus - through digital channels. This combination of onsite and digital services not only prepares you for the current and future world of work, but it means that services are available throughout the day, and sometimes into the evening, either from home or from our city location. Plus, you’ll get to enjoy the cafes and city life! ECU Vice-Chancellor Professor Steve Chapman CBE, welcomes international students to study selected ECU courses at central locations in Melbourne and Sydney. Melbourne is one of the world's most liveable cities with a reputation for world class dining, art galleries, fashion and sport. Melbourne is a dynamic, cosmopolitan city often referred to as the cultural capital of Australia. 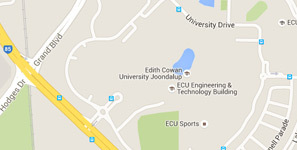 ECU Melbourne is situated in the centre of this thriving city. Sydney is the largest city in Australia and is best known for the iconic Sydney Harbour Bridge and Sydney Opera House. Sydney has a lively and vibrant buzz that makes it a great place to visit throughout the year. There is always plenty to do in Sydney – from world class dining, shows and entertainment to sightseeing or enjoying the sand and surf at one of Sydney's beautiful beaches. ECU Sydney is located within walking distance of 'The Rocks', a tourist precinct and historic area in Sydney's city centre.